ATLANTA GA, May12th, 2016 — IronCAD, LLC, the leading provider of design productivity solutions, announced that effective immediately all IronCAD product versions 2016 and higher will now be using new download manager technology. This is to improve the speed and reliability of downloads and to simply the install process ensuring a higher quality user experience. IronCAD in partnering with Akamai and Solid State Networks, has developed a new download system for delivering their software solutions and content. Previously, users had to download IronCAD via a web browser, which given the large size of the download, may be cancelled due to time constraints or a dropped internet connection. With this new partnership and download manager, users simply download a small 2 MB download manager that requires no installation and runs the application. Once launched, the download manager will begin the download process delivering the IronCAD software from Akamai’s global content delivery network. Users can download the entire application, pause, even cancel and then resume at a later. 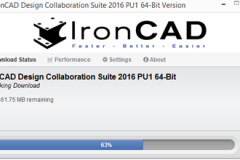 Once the download is complete, the IronCAD software will begin the install process automatically. Try out the new IronCAD Download Manager at www.ironcad.com/download. Based in Atlanta, GA, IronCAD is a leading provider of 3D Design Productivity Solutions that deliver the highest levels of customer satisfaction and productivity. Individual components of this solution can be used standalone, complementary within an existing design environment, or can be used together to collaborate effectively throughout the enterprise to extend productivity. Its flagship product IRONCAD has won many industry awards for its innovative technology and leads the industry in its ease of use and design productivity. For more information on IronCAD, call 1-800-339-7304 or visit www.ironcad.com. Solid State Networks is the developer of the leading digital asset deployment solution DIRECT. Industry-leading software companies, game studios, and digital publishers rely on DIRECT for the global delivery of their business-critical digital assets. Solid State Networks deployment technology provides fast and reliable delivery regardless of the file size or location on the world’s largest network. For more information about Solid State Networks and how DIRECT can optimize the global deployment of your digital assets, visit www.solidstatenetworks.com or www.directdlm.com, you can also follow @SolidStateNet on Twitter.